The Winnipeg Jets conclude a three-game road trip tonight against the New York Islanders…The Jets are 2-0 on the road trip after beating the New York Rangers 4-3 in a shootout on Sunday night…Winnipeg returns home after tonight’s game where they will start a four-game homestand on Friday against the St. Louis Blues. For the first time in franchise history, the Jets swept a back-to-back set by winning both games in overtime or a shootout – 4-3 OTW at NJD and 4-3 SOW at NYR…The Jets are 3-2 in games decided in overtime or a shootout this season, but 8-2 in their last 10 games that have needed overtime or a shootout to determine a winner. The Jets have won three consecutive games for third time this season, which matches a season high…Winnipeg has also won three consecutive road games for the first time this season. Winnipeg has scored 35 goals in their last eight games for an average of 4.4 goals per game…Winnipeg has scored four goals in four of their last five games…The Jets are tied for sixth in the NHL this season with an average of 3.46 goals per game. The Jets have won three consecutive games by one goal to double their one-goal win total to six (6-2-2) this season…Last season, the Jets were 22-4-10 in one-goal games. Winnipeg scored three goals in the third period on Sunday to erase a 3-0 deficit and win their second game this season when trailing after the second period (2-5-0)…The Jets have scored 37 goals in third periods this season, which is the third most in the NHL…The Jets also gave up the first goal off the game on Sunday, but came back to improve their record to 8-3-0 this season when their opponent scores first for an NHL best .727 winning percentage. 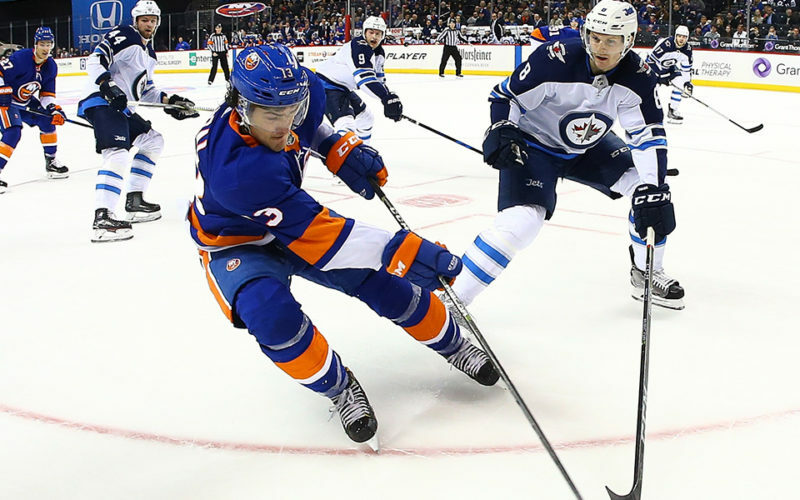 The Jets are 7-4-1 against Eastern Conference teams this season, including 5-1-0 against the Metropolitan Division…Winnipeg went 19-7-6 against the Eastern Conference last season, including a 10-3-3 record versus the Atlantic Division and 9-4-3 record against the Metropolitan Division. Mark Scheifele was named the NHL’s First Star of the Week on Monday…He opened the week with a pair of goals in Winnipeg’s 4-3 setback to Pittsburgh on Tuesday…On Thursday, the Kitchener, Ont. native matched a career high with three assists and a plus-five rating in the Jets’ 6-5 win over the Chicago Blackhawks…Scheifele scored a pair of goals, including the overtime winner, as Winnipeg opened a three-game road trip on Saturday with a 4-3 victory over New Jersey…On Sunday, he scored on the power play and added the decisive marker in the shootout as the Jets came from 3-0 down to win 4-3 over the New York Rangers…In total last week, Scheifele tied for the league lead in goals with five and was second in points with eight (5G, 3A), and he is currently riding a five-game point streak (5G, 4A)…This is the second time this season (also Oct. 29 – Second Star) and the fifth time in his career that Scheifele has been selected in the NHL’s Three Stars of the Week…Scheifele joins Patrik Laine (Nov. 26 – First Star) and Blake Wheeler (Nov. 12 – Second Star) as members of the Jets that have earned NHL Three Stars of the Week honours this season. In addition to Scheifele’s five-game scoring streak, Blake Wheeler is on a five-game point and assist streak (1G, 8A)…It’s Wheeler’s second point streak of at least five games this season after he had an 11-game point streak from Oct. 18-Nov. 14 (2G, 18A)…Josh Morrissey (1G, 1A), Mathieu Perreault (2A) and Jack Roslovic (1G, 1A) have points in back-to-back games. With three defencemen on injured reserve, Josh Morrissey has played the top three minutes in a game in his career in the last three games…After establishing a new career high of 28:59 on Thursday against Chicago, Morrissey bested that with 29:02 of ice time on Saturday against New Jersey…Morrissey played 28:11 on Sunday against the Rangers, which is the third most of his career…Morrissey leads the Jets with 597:30 of ice time this season. Patrik Laine was named the NHL’s First Star of the Month for November on Saturday…Laine tallied five goals on Nov. 24 to become the first NHLer since Johan Franzen in 2011 to score five goals in a game, while being just the third player in league history to score five in a game before his 21st birthday, and only the fifth player since 1959-60 to score five goals in a game on only five shots…Laine’s first goal of the game on Nov. 29 against Chicago gave him 20 on the season and was also the 100th goal of his NHL career, while his second tally gave him 18 goals in November…Laine (20 years, 224 days) became the fourth-youngest player in NHL history to score 100 goals and his 20 goals in the first 24 games tied Ilya Kovalchuk for the franchise record for fewest games to reach 20 markers…The 18 goals in November made Laine one of just 11 different players in league history to score 18-or-more in a calendar month and he was the first since Pavel Bure in March 1994…Laine also had 13 goals in the final six games of the month, as he became one of just seven players to record 13-or-more goals over six team games…This is the first time in his career that Laine has been selected in the NHL’s Three Stars of the Month…He is the first Jets player to be selected since the franchise returned to Winnipeg…Laine joins Dustin Byfuglien (Nov. 2010 – Third Star), Ilya Kovalchuk (Feb. 2009 – First Star, Nov. 2007 – First Star, Oct. 2006 – Second Star) and Marian Hossa (Nov. 2006 – Second Star) as members of the franchise that have earned NHL Three Stars of the Month honours.